Regardless of one's circumstances, anger, the emotion that "includes, conceptually, not only the idea of a serious wrong […], but also the idea that it would be a good thing if the wrongdoer suffered some bad consequences" (Nussbaum 5), is normatively problematic. This is one central idea in Martha Nussbaum's thorough analysis of anger and its possible counterpart, forgiveness. 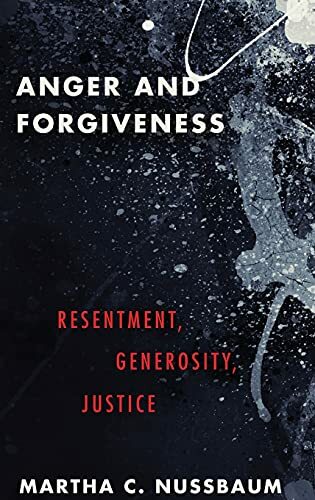 In her recent volume, Anger and Forgiveness: Resentment, Generosity, Justice, she points to two general paths of anger. The first one, "the road of payback, makes the mistake of thinking that the suffering of the wrongdoer somehow restores […] the important thing that was damaged" (5). The second, the road of status, assumes that the victim sees the injury as about relative status. Thus, it seems that it may make sense to believe that harming the wrongdoer would lower his status and would thus achieve results because it would reposition the status of the victim. However, Nussbaum believes that this path is also normatively problematic because it exclusively focuses on one's status--a "type of obsessive narrowness" (6) that is to be discouraged. Nussbaum offers a different solution. She proposes a Transition phase, in which anger is directed toward the future, toward transforming the world so that evil actions would be diminished. In the Transition, people recognize that the strong desires to harm the perpetrator are not reasonable and they move toward "forward-looking thoughts, asking what can actually be done to increase either personal or social welfare" (6). While having a consequentialist flavor, her theory also relies on the idea that all human beings, regardless of their actions, share one thing: their dignity of human beings, which remains present even in cases when their evil actions are unbearable. The most significant case she offers is that of the Afrikaans who imposed the criminal regime of apartheid in South Africa. Before coming back to this case, I will discuss a bit her account, focusing especially on forgiveness. Nussbaum's analysis is thorough. She considers three different realms: the personal realm, where one is harmed by people who are in one's immediate familiar circle, the Middle Realm, in which she includes "the multitude of daily transactions we have with people and social groups who are not our close friends and are also not our political institutions" (7), and the political realm. For each one of them, she points out that anger is problematic and, even if it may lead to some immediate results in the case of status related injuries, it is finally based on a self-centered attitude that can only result in lack of understanding of another and thus further pain. Nussbaum works against a widespread belief that anger is a rational response in the face of harm. However, her rejection of anger is not new; one can find such accounts in literary or philosophical writings, so I will not focus here on this aspect of her book. Nussbaum is careful to not deny that the emotion is likely to be resented whenever we experience harm, but she shows how one must move toward Transition: the energy that the emotion has produced is canalized toward doing something about the situation. There is one question that remains, though: how can one deal with one's feelings of anger? The author rejects that forgiveness is an appropriate path, and it is here that her book is quite novel, so I will focus the discussion of this aspect. First, the author acknowledges that psychologists usually point to forgiveness in dealing with anger. One is encouraged to forgive the wrongdoer, but also oneself. However, Nussbaum claims that forgiveness is not the appropriate answer because it is not free of moral danger. She correctly criticizes both transactional and unconditional forgiveness because in both cases one sets up oneself as morally superior to another. In the first option, one expects some payment from the wrongdoer, while in the second option, one deems oneself superior in one's ability to offer forgiveness. At the same time, "unconditional forgiveness remains backward-looking and not Transitional. It says nothing about constructing a productive future" (76). In forgiveness, one legitimizes the two roads that Nussbaum criticizes in anger: the road of payback and the road of status. Nussbaum discusses such mercy by looking at the story of the prodigal son, a biblical text that she correctly underlines as rejecting the idea of transactional forgiveness. She asks, where is forgiveness in this story? And she is right: if forgiveness is transactional or unconditional, then there is no forgiveness here. Even more, forgiveness is irrelevant from the point of view of the father. If the father can say anything about forgiveness, he can only say, "you are pre-forgiven." In other words, "you already are present within my love. You have never departed. When you chose to leave, it was as if you were dead, but now you are alive again. There is no forgiveness that I can give you because there is nothing that you have lost from my part. In my love, you have been alive; now, you can also experience this life." This would mean that the father in the story creates of a space in which there is absence of judgment and in which the son would always feel at home as long as he decides to return there. So there is no question of forgiveness from the point of view of the lover, but one cannot say that there is no harm done. The lover suffers terribly. "Love is both helpless and intensely painful" (104), Nussbaum acknowledges. I think this is why forgiveness still makes sense from the perspective of the one who has harmed. It is not that the harmed party has anything to offer since he or she has already offered everything, but rather that the wrongdoer needs to access that love, to actualize forgiveness. To use an Aristotelian framework, one may say that in cases of generosity, forgiveness is always potential: that is, the harmed party maintains the wrongdoer in one's heart regardless of his actions. However, forgiveness is actualized only when the wrongdoer returns. A spring of water does nothing for the one who does not drink out of it. This may raise a question: why does Jesus say from the cross, "forgive them, Father, for they do not know what they do?" Would God not offer forgiveness unless he is asked for it? I think even this shows an example about access: when there is no attempt for the part of the wrongdoer to access the spring of love, the plea for forgiveness is asking for a miracle: one asks for the miracle of being taken in a love that one does not deserve. It is about helplessness, of which Nussbaum also writes. She notices that helplessness comes first (103), and this is important because if we hold on to the idea that we can repair the world, regardless of how strong this belief may be, then anger is still available, still justifiable. Anger loses in justification when we realize that there is nothing that we can do. The political realm is relevant here. Mandela, whom Nussbaum praises for his generous attitude toward those who persecuted him, realizes that there is nothing that he can do by force. There are similar accounts from people who were persecuted during the years of communism in Eastern Europe; while feisty at the beginning of their imprisonment, they realized that fighting against the persecutors would only establish a cessation between human beings and also within themselves. Over the years, this fight often turned to acceptance, but not a passive acceptance: they rather became free, including from the point of view that violence can achieve anything. In fact, Nussbaum reminds us that, culturally, people are often inclined to deem anger positively because it shows manhood. The example she uses is quite telling. When a reporter observed marchers who, without having any reaction of defense, were getting beaten by the police (220), he reacted with perplexity: "I felt an indefinable sense of helpless rage and loathing, almost as much against the men who were submitting unresistingly to being beaten as against the police wielding the clubs" (cf. Nussbaum 220). This brings us to the possibility of love and generosity within the political realm. Can such love work within a society? Nussbaum believes that it can, and she offers three examples that point to the idea that one must refuse to play the blame game and acknowledge that we are all in this together (see p. 209). The three characters are Gandhi, Martin Luther King, and Mandela. Each one of these have their own particularities, and Nussbaum is careful to show that only some of the actions are similar in kind to the attitude of the father from the prodigal son parable. When we consider crime within a society, Nussbaum points to the attitude that people have within the majority of legal systems: we think about how to justify punishment. That is, we look at the crime and judge the kind of punishment that the doer deserves. Nussbaum proposes a different approach. Instead of thinking of law in retributive terms, she proposes a similar future-oriented approach that she has had in the interpersonal and the Middle Realms. To do so, one would need to consider another human being as equal in human dignity regardless of the actions in which that human being was involved. Thus, even Hitler or Stalin would benefit of the same treatment: the question for a society dealing with them would not be how to punish them so that they would pay for their evil actions, but rather what to do so that from now on we would avoid such evil and also heal society. This does not mean, of course, that radical punishment is out of the question. As Nussbaum acknowledges, in our dealings with Hitler we would not hope that surrounding him with love, as Gandhi seems to suggest, would work in his case. However, whatever the society would do, this would be done without the assumption that the perpetrator, regardless of how evil his actions may have been, has lost all human dignity. The most relevant case that she discusses is how South Africa succeeded relatively to advance from a society with hatred towards one with acceptance. And Nussbaum points out that "even people who seem as evil as can be, for example the Afrikaners who administered the evil system of apartheid, do contain the capacity for good, and if they are approached in that spirit, rather than sternly held to account, they may become cooperative and productive citizens" (193). While anger is normatively problematic, Nussbaum acknowledges that anger is an emotion that one can hardly deny. However, she suggests that this emotion is not hardwired in a human brain, and thus we can fight against it. While it is a difficult task, Nussbaum suggests that one should try it and not be deterred by the greatness of the task. "Anger is hard," Nussbaum says. "But so are many other things in life. Why do contemporary Americans tend to think that health, and learning, and fitness deserve tough personal effort, and anger does not? Why do we think that medical and economic research deserve our public political effort, and that the social disease of anger does not?" (248). Indeed it does, and we should follow Nussbaum's encouragement to fight against it. The question remains, how? Perhaps the solution can be found in the same parable of the prodigal son that is in the background of the entire discussion. The father who awaits home empties himself. He has no expectations; he has no judgment; one may say that he has no self. His only self is love, and this is how he lives in the world: as an eternal flow of goodness.